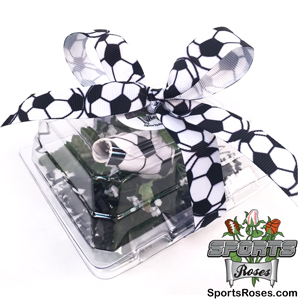 The Soccer Rose Boutonnière Gift Arrangement adds an elegant clear case and basketball ribbon to display and protect the boutonniere. 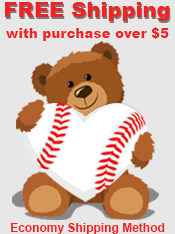 Give a special gift your loved one will treasure forever. 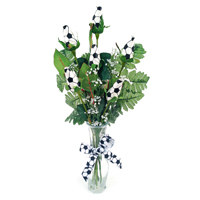 The Soccer Rose Boutonnière incorporates the same handmade Soccer Rosebud used on our regular stems into an arrangement designed for special occasions and formal wear. 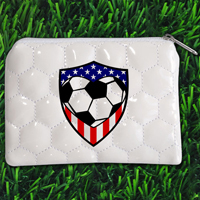 These boutonnières are perfect for homecoming, weddings, prom, banquets and funerals where formal attire is required but where you want to make your own special statement about your love for soccer. Personalize It! Petal imprinting service available. Add a player name & number or other special message (up to 15 characters) to a petal on the boutonniere. 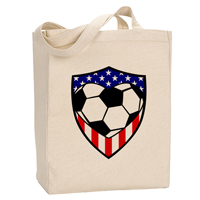 Buy in Bulk and $AVE! 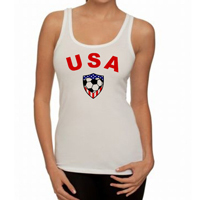 :Click the Discounts tab to view our volume pricing tiers. 6/23/2013 – Do you make a small version for ring bearers?